Click here to see upcoming versions and planned features. Bug fixed: Function keys set under "start with" not working correctly. Flow control (handshaking) functionality added (XON/XOFF software flow control and RTS/CTS hardware flow control). New device profiles: Mettler Toledo (MT-SICS), Sartorius (SBI), Sartorius (SICS), Denver Instrument. Previous "Sartorius" device profile renamed to "Sartorius (legacy)" and modified to set flow control to "RTS/CTS" when set defaults button is pressed. Fixed a bug which prevented licenses from being applied on operating systems with system locale set to Indonesian, Malay, Hebrew, Arabic, Chinese, Japanese, Thai, Vietnamese or Hindi. License details can now be displayed by going to the license tab, selecting the license and clicking on the show button. Bug fixed: Error message is shown on startup and program exits if a Plus device has been chosen and the Plus trial license has expired. Bug fixed: Error message is shown on shutdown if a Plus device has been chosen and the Plus license has been removed by the user. Bug fixed: Minus sign of negative numbers not recognized if there is a whitespace character in between the sign and the number. Plus devices: The following devices now require a Plus license as they use custom regular expressions (a "Plus" feature): Adam AZextra (weight), Adam GC (weight), Adam GC (pcs), Adam label format, Kern MPS / MPT / MXS / MWS / MTS / MCB, Tanita TL-280/TL-290. Do not update if you're currently using these devices and don't want to buy a Plus license. Alternate "end with" key to enter values in multiple columns. Usability improvement: validation of input fields. Alt numpad input method (independent of keyboard layout). New device profile: Kern 440 balance. Supported keyboard layouts (for alphanumeric characters): US (QUERTY), United States-International (QUERTY), French (AZERTY), German (QUERTY). Support for new licensing models added. Bug fixed: Default terminator for Adam CBK/GBK/GFK set to "10<LF>". Bug fixed: Character codes >127 shown as negative numbers in event log. Bug fixed: Space missing between "unsent data:" message and list of characters. Convert tab renamed to process to better reflect functionality (process captured data). Default settings in settings tab changed (all disabled by default except for update check). Bug fixed: "Text" devices are shown with HTML tags in event log. Bug fixed: List of applied licenses allows multiple selection. Number and text devices can be distinguished in the device list. Functions which cannot be applied to text devices are disabled (greyed out). Keyence IL Series Laser Sensor* (one sensor with DL-RS1A RS-232C Communication Unit and external input to DRQ terminal). Plus tab renamed to license tab. New multi-user / multi device edition 232key MU available for testing. Fixed bug: Minus sign not typed in Microsoft Excel when Num Lock is off. Fixed bug: Error message shown on program start when no license key has been applied. Fixed bug: Character "Z" not typed on AZERTY keyboards. Fixed bug: Auto port detection not stopped when closing window with X button. * These features require a Plus license. * Requires a Plus license. Improved usability with renamed tabs and reorganized settings: interface tab is now input tab, format tab has been split into new convert and output tabs. Improved text field validation (in convert tab). New setting: "Abort auto-start if previously used port not available". 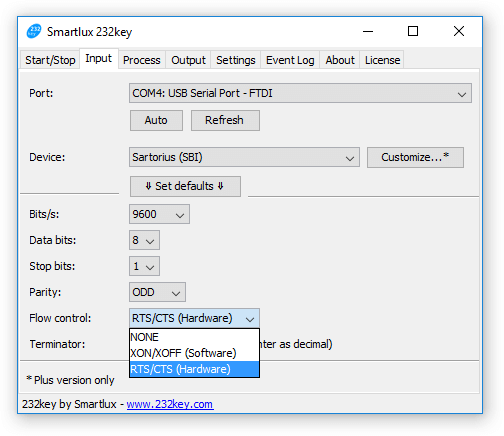 * 232key now remembers which port was last used to connect to your serial device. 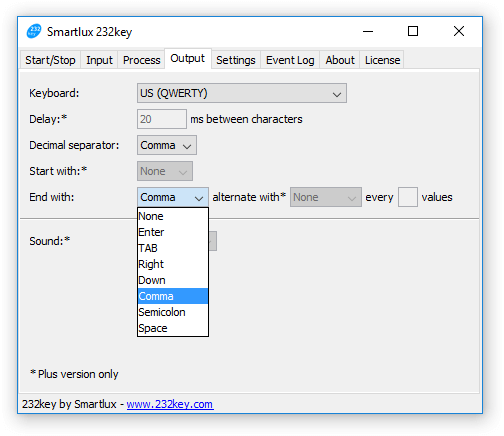 If you have selected the auto-start function and the last used port is no longer available, 232key will now show an error message if the "abort auto-start" box is checked. If left unchecked, 232key will auto-connect to the first available port (this was the default behavior prior to this release). * This feature requires a Plus license. Port to be used by 232key can be passed as a parameter (argument), e.g. "232key.exe COM3". This prevents 232key from trying to discover and list all ports available on the system. Device name is recorded in event log to simplify troubleshooting. Improved support for Kern MPS scales (older models using different format than current ones). New device profile: Adam Equipment AZextra scales (weight in kg only). Button to refresh list of ports. Color-coded event log: highlights the characters which were extracted by 232key from the data sent by the connected device (this can greatly simplify troubleshooting). Automatic update check: checks for updates (without transferring any data from your PC) and shows a notification in the status bar if a new version is available. Update check is skipped if "auto start" is activated (Plus version only). Status bar: URLs are now clickable. German version: missing translations added (German version is available from www.waagen.lu/232key). New device profile: A&D EM scales (tested). New device profile: Kern KFB indicator (used by Kern IFB series scales and others; tested). New device profile: Tanita TL-280/TL-290 scales. Fixed bug: program terminates without error message when no COM port found on system. Fixed bug: splash screen not shown on program start. 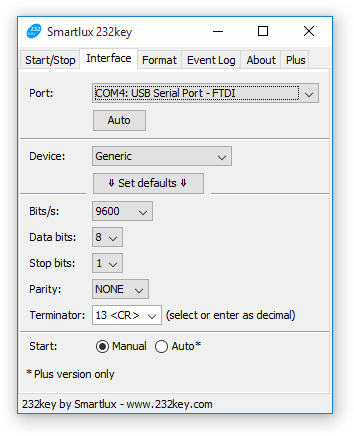 This is particularly useful if you're using a converter (RS-232 to USB). Improved German translation (German version can be found at http://www.waagen.lu/232key). All of these improvements are available in the free version of 232key. New device profile: Kern MPS. German translation (German version can be found at www.waagen.lu/232key). Minor bug fixes (232-15 and operand field tooltip). New device profile "Barcode alphanumeric" provides basic support for alphanumeric barcodes (characters A-Z and digits 0-9). New device profiles: Adam Equipment CBK scale, Adam Equipment Highland balance, Sartorius. Improved COM port detection (should fix bug 232-27). * This feature requires a paid license. "Start with": a key that can be sent before 232key types the measurement value* (many thanks to Jacques at luxcaddy.lu for the suggestion). Device profiles for Precisa and Mettler Toledo. Internal improvements to ensure data integrity. Format settings: Renamed "terminate with" to "end with". Expired trial licenses are removed automatically. 232key icon is displayed in title bar. Program version details (OS, architecture and language) are shown in about tab. EULA has been rewritten and reformatted. Default button in interface tab renamed to ⇓set defaults⇓ and repositioned. Tooltips added to many elements. New feature: 232key window is minimized on program start when "auto-start" is enabled (Plus version only). This version fixes several minor bugs: 232-18, 232-20 and 232-21. Development of 232key started just over one year ago on March 1st, 2014. Today, we're happy to announce the release of version 1.00! We'd like to thank our users for their bug reports, feature requests and encouraging emails. Of course, the development of 232key does not end today. Please sign up for our newsletter or follow us on twitter to stay current on future updates. Plus license: Try out all of the 232key Plus features using license key vrYuxl4n1LHIF3GH/m6wZT9SX7E7ChFr!mqlL/bK9FxM= (valid until March 31). You can also purchase a (non-expiring) license through our trusted reseller FastSpring for the special introductory price of 30 US$ or 28 € (including VAT, where applicable). Plus features: Rounding and a confirmation sound can be enabled in the format tab. Auto-start is available in the interface tab (automatically connects to your device and starts the virtual keyboard wedge when 232key is started). New "barcode" device: This new (generic) device prevents leading zeros from being suppressed. Kern DE: Default settings were added for scales using the popular Kern DE indicator. Improved auto-save: Changed settings are saved as soon as you switch to another tab (or when the program is closed, as before). Bug 232-17 fixed: Keystroke simulation now works with AZERTY keyboards (please select appropriate "keyboard type" in format tab). New feature: Warning is displayed if "Caps Lock" is on. Plus version feature preview: New features available in the upcoming "Plus" version are displayed in the user interface (but cannot be used yet). 232key Plus licenses will be available for purchase in February 2015. Adam Label format: To use this multi-line format, a paid device license will be required in future versions of 232key. This is now indicated in 232key. Bug 232-14 fixed: Error message "Error while loading settings" no longer appears when program is first started after installation. Feature: Error message is now displayed if loading or auto-saving of settings fails (access to registry denied). Feature: New device "Ohaus SPU, TA, NV" with default settings for Ohaus Scout Pro, Traveller and Navigator has been added.